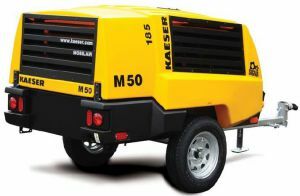 Here at Walker Miller Equipment, we are proud to announce we currently have six Kaeser Model M50 Air Compressors in stock and ready to work! The Mobilair M50 is a versatile portable air compressors 185CFM air compressor that offers heavy-duty performance in a lightweight package. It is well suited for many applications including sand-blasting, pavement breaking, and general air tool use. These units are built to meet the demands of rental houses, repair trucks, and railroad applications. The Kaeser Model M50 features a compact-functional design, easy access canopy, large fuel tank capacity, tool box, solid steel floor, and much more! These compressors are built to last with a 2-year manufacturer warranty included on both engine and compressor. Swing by today to purchase one of 6 currently available in stock! They won’t last long!